Was going to post this on DIY but I didn't specifically build anything to make this project work. 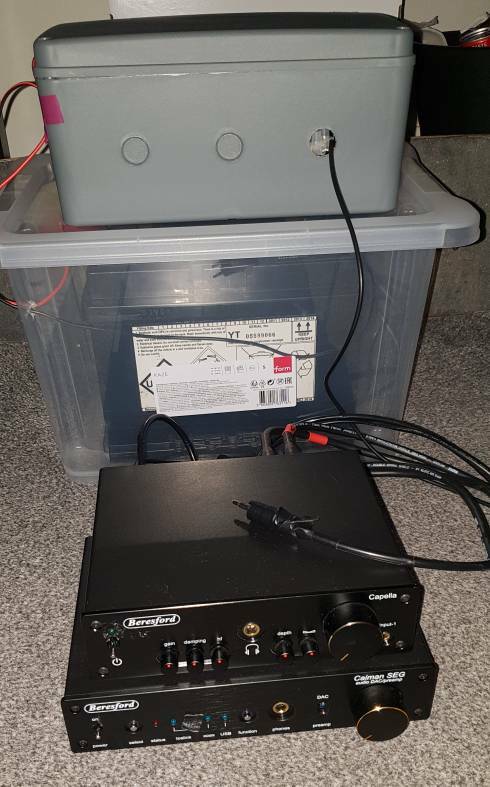 Currently using a car battery to power my headphone rig. Cost me roughly £40. A lot of it could cheaper if bought from a car parts store (switch & fuse for example). -DC adapter positive and negative wire connected to left and right of block strip connector. Positive side to inline fuse, negative side to rocker switch. The battery powers my Capella amp which provides power for the SEG DAC. I've experimented putting the Dorado in front of all that but haven't heard a difference yet, need to give it more time. All of this is a bit of a hassle but it is worth it for the clarity it gives. The noise floor is non existent to my ears with this set up, I can't recommend it enough. Hifi: MacBook Pro > Fisual Pearl Optical > CA DAC Magic+ > Sony AV > Tellurium Ultra Blue > Kef IQ50. Havent you got the mains yet ?? Nice -apart from the Amazon references! Use local shops!! I'm wondering, as I often do in these cases, if there's a very patient MRS Silent ? Whilst I admire your dedication in the pursuit of audio satisfaction, I've just got to say that looks like a dog's dinner of a lash up to me. I would never have such an arrangement anywhere near where I listen to music, or even in my house! Presumably you take the car battery outside to charge? You are aware that hydrogen is created whilst charging a lead acid battery? You seem to have it in a container (presumably to protect from possible spills of sulphuric acid?). Don't charge it whilst in there; hydrogen becomes explosive at around 4% concentration. It's not dangerous in use - unless you trip over it, or bang your head on it, or somehow bridge both connections together while holding one of them.